Place the breadcrumbs and milk in large bowl and set aside. Heat 1 tablespoon of the oil in a large non-stick frying pan over medium heat. Add the onion, garlic, porcini mushroom, caraway seeds, salt and pepper, and cook for 5 minutes or until softened. Add the porcini mixture, lentils, eggwhite, parsley and mustard to the breadcrumb mixture and mix well to combine. Roll teaspoonfuls of the mixture into 34 balls and set aside. Heat 1 tablespoon of the oil in a large non-stick frying pan over medium heat. Add half of the lentil and rye balls and cook, turning occasionally, for 6 minutes or until golden. Set aside and keep warm. Repeat with remaining lentil and rye balls. While the lentil and rye balls are cooking, cook the pasta in a saucepan of salted boiling water for 6–8 minutes or until al dente. Drain, reserving 1 cup (250ml) of the cooking liquid. Heat the remaining oil in the frying pan over high heat. Add the mixed mushrooms and cook for 6 minutes or until softened. Add the cream and reserved cooking liquid, and bring to a simmer. Return the lentil and rye balls to the pan. Add the pasta and gently toss to combine. 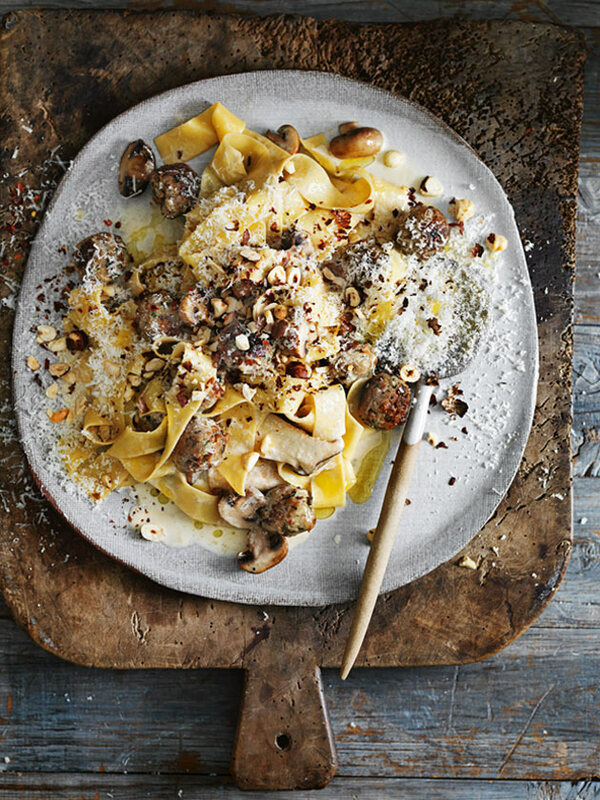 Top with the hazelnut, parmesan and chilli flakes to serve. Serves 4–6. + We used Swiss brown, king and chestnut mushrooms.